I think we can all agree that a little nostalgia gets you through the day. In the case of my personal gaming history, I can’t look back without fondly remembering a certain purple dragon (no, not Barney). Spyro played a considerable role in helping grow my love for video games, and it’s always held a place in my heart. When I heard there would be a remaster of the original trilogy coming out, I was ecstatic. I hadn’t been able to play a Spyro title in ages, and I was itching to glide around and shoot flames at unsuspecting enemies. I had high hopes for Spyro Reignited Trilogy after how well the Crash Bandicoot N. Sane Trilogy did, and I am absolutely not disappointed. As this is a series of remasters, you’d expect the game-play to be familiar, and you wouldn’t be disappointed. I’ll admit, it took me a little bit of time to get used to the controls again, and I often resorted to using the D-pad for more control, as games back in the day handled much differently than they do now, but everything felt like home. The camera is a bit wonky, but it’s not a huge detriment and something that can easily be compensated for and gotten used to. I had forgotten what it was like to careen around the world as Spyro and how quickly you can get ahead of yourself if you don’t keep a very close eye on your controls. I’m not ashamed to admit (okay, maybe a little) that I died in quite a few embarrassing ways, like running headfirst into a lake or off a cliff. Realistically, a lot of people who are newcomers to the series may have a little bit of a hard time with Spyro Reignited Trilogy, especially when it comes to the inverted challenges, but after a bit of time you get comfortable with it and realize how much we’ve taken smooth, stabilized controls for granted these days. When it comes to length, I absolutely think you get a good bang for your buck with Spyro Reignited Trilogy. Around four hours in, I would usually hit fifty percent completion on any of the three titles, so I’ll wager it took me twenty-five hours or so to finish everything, and that’s not as a completionist; that’s just plowing through the levels. I’ve seen people beat the games sooner, but even a player more skilled than I who insisted on finding all the hidden goodies took close to thirty hours. Personally, for the price of these remasters, that’s a steal. Difficulty is a whole other ballgame. As I mentioned, the controls can take some time to get used to and are very sensitive, so I found myself having to repeat the same jump and glide upwards of ten times before I’d get the timing and angle just right. In addition to normal level challenges, there are flight-centered worlds that are time trials, with inverted controls. To be honest, I skipped most of these, but do intend to go back and complete them some day. Inverted controls were never something I was good at, and these flight challenges are extremely difficult for me, but still fun to try! The various stories in Spyro Reignited Trilogy are relatively basic, but not overly so. In Spyro The Dragon, your goal is to rescue all your dragon friends who have been crystallized by the villain Gnasty Gnorc. You make your way through each of the homeworlds and free all the dragons to save the day! In Spyro 2: Ripto’s Rage! the bad guy, Ripto, has taken control of the homeworlds and holds them captive. It’s up to you to travel to each area and defeat his minions to upset his evil plans. Finally, in Spyro: Year of the Dragon, a mysterious sorceress appears and steals all of the dragon eggs. You are tasked with defeating the Rhynoc army and recovering all of the eggs. In reality, there isn’t a tremendous amount of depth to these tales of good versus evil, but they’re enough to give you a little extra push to overcome the challenges and explore each new area. The best part of any remaster is the graphics; at least, it should be. In the case of Spyro Reignited Trilogy, they hit the nail on the head. When I first booted up the game and saw Spyro in all his vibrant glory, I almost cried tears of joy. 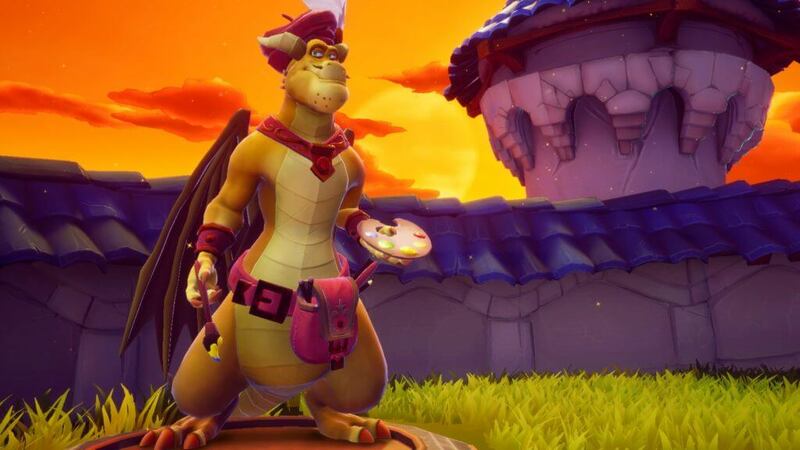 His animation is smooth and flowing, and he looks like himself, not that horrid Skylanders reimagining. The homeworlds and different areas are all equally gorgeous and colorful; I even spent a few seconds just marveling at how I could scorch the grass around me with a little burst of flame and actually watch the blades wither and burn. The graphics updates don’t stop at Spyro’s animation; everyone got an upgrade. Each dragon you rescue and enemy you see is just as spectacularly rendered as our purple friend, even the little animals you have to crisp to feed Sparx bounce around adorably. I’m not surprised so much as elated that so much care was taken with these titles to really bring them up to today’s standards, and yet keep as much of the original integrity as they did. You can tell the team working on Reignited Trilogy really cares. As with the graphics, the sound design got a complete update. All of the original sound effects and music are there, and then some. The original voice of Spyro from Ripto’s Rage! and Year of the Dragon, Tom Kenny, returns to revamp his lines and lend his voice to the first title as well, where Spyro was initially voiced by Carlos Alazraqui. Also making a re-appearance is Stewart Copeland, who wrote the original soundtrack for the games. Mr. Copeland’s works are remastered by the developer, and he wrote a new theme for the compilation. So not only do all of the sound effects and in-game noises sound familiar, if much more clean and clear, but we get a voice we know and an updated original soundtrack. It really does feel like so much love and care were poured into this project. I can’t express how pleased I am with the attention to detail. Spyro Reignited Trilogy is exactly what I was hoping for when the idea of remastering the old favorites was first announced. The controls are classic but with a smoothness that has come from years of upgraded technology. The graphics are gorgeous and brilliantly colorful yet still true to the original aesthetic that I remember, and the details as small as the sound of sheep bouncing around are clean and bright but still familiar. Each and every aspect of these games is old enough to feel like home but refreshing enough to bring you an entirely new experience. If you loved Spyro as a child, as I did, you absolutely need to pick up this remaster. 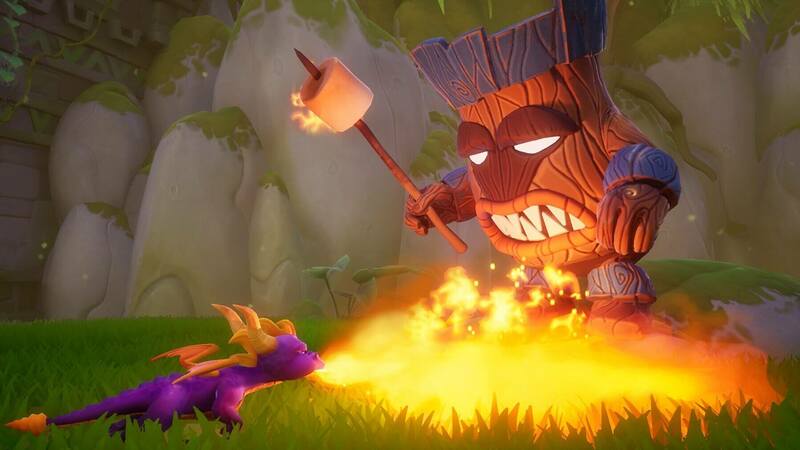 Heck, if you loved Spyro as an adult, you still need to pick up Reignited Trilogy. Everyone deserves a chance to play these enchanting titles in all their modernized glory. Spyro Reignited Trilogy is a dream come true for any Spyro fan. The sound design, graphics, and gameplay are all familiar, but brand spanking new. If you have a long-standing love for this little purple dragon, this trilogy is a must-have.